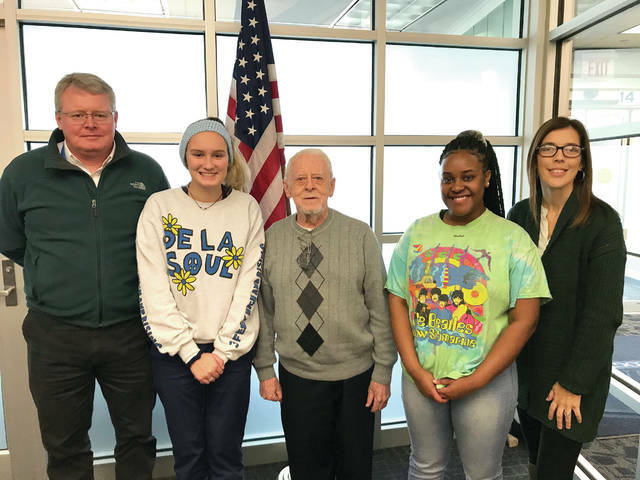 ENGLEWOOD — Three Miami Valley Career Technology Center (MVCTC) students were selected as the finalist for the Voice of Democracy Essay contest by VFW Post 5018 in Dayton. VFW representative, John Mays, visited MVCTC on Tuesday, Nov. 13, to recognize the finalists. First place went to Kylie Kendrick, a pre-nursing student from Tipp City, second place Darius Benton, a dental assisting student from Eaton, and third place went to Ahliya Brown, a business ownership student from Northmont. Each student received a cash prize, first place $150, second place $100, and third place $50. Awards were presented by Mays, a Navy veteran that served as Hospital Corp on various submarines from 1953-1972. Mays was a beloved substitute teacher for many years at MVCTC and still visits every year to work with students on the Voice of Democracy Contest. According to the VFW website, “Established in 1947, our Voice of Democracy audio-essay program provides high school students with the unique opportunity to express themselves in regards to a democratic and patriotic-themed recorded essay. Each year, nearly 40,000 9-12 grade students from across the country enter to win their share of $2.1 million in educational scholarships and incentives awarded through the program. The national first-place winner receives a $30,000 scholarship paid directly to the recipient’s American university, college or vocational/technical school. For more information about the Voice of Democracy Contest, please visit www.vfw.org/VOD. For more information about MVCTC, please visit www.mvctc.com.